The Ki-27 was the army's main fighter until the start of World War II. In the 1939 Battle of Kalhin Gol against USSR in Mongolia, Ki-27 faced I-15 biplanes and I-16 monoplanes, and dominated them with its maneuverability, downing a total of 1,252 enemy aircraft. The Ki-27's high turn performance caused the Army to focus almost exclusively on maneuverability, a decision which came back to haunt them later as it handicapped the development of more heavily armed and faster fighters. The Ki-27 served until thebeginning of World War II in the Pacific, escorting bombers attacking Singapore. After it was replaced by the Ki-43, Ki-27 continuing to serve as a trainer, was used in 'back water' areas and for home defense. It was also exported for use with Manchukuo and Thai armed forces, seeing combat with both. In Thai service, the Ki-27 reportedly damaged a P-51 Mustang and shot down one P-38 Lightning. 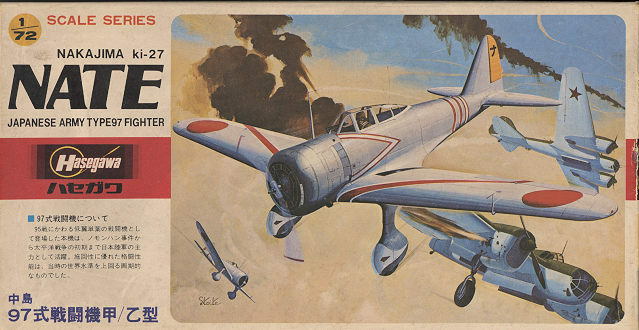 Near the end of World War II, a few Ki-27 were equipped with up to 500 kg (1,100 lb) of explosives for Kamikaze duty. In spite of its excellent turning performance, in combat Ki-27 suffered from lack of armor protection for the pilot and absence of self-sealing or fire suppression in the fuel tanks. In addition, the airframe could not handle the stress of high speeds and Soviet pilots routinely escaped Ki-27 attacks in a dive. The armament of two rifle-caliber machine guns was weak. Many of these planes were shot down by the P-40s of the AVG. The main difference between the Ki-27a and Ki-27b was the latter's addition of bomb racks and the provision for under wing fuel tanks. The cockpit is rather basic with a floor, control stick and seat back shape. There is no decal for the instrument panel. The cockpit is supposed to be filled with pilot so any detailing will have to come from somewhere else. A single piece engine/oil cooler assembly is provided and it fits into a single-piece cowling. Interestingly, the Hucks starter lug is a separate piece and fits on the prop. A one piece lower wing and two upper halves are the norm for this and it fits under the completed fuselage. Now for the options. You can have standard landing gear, the lower fairing removed, or later gear with balloon tires. Fuel tanks are provided and if you don't want to use them, you have to fill the placement holes. One also has an early or later rear canopy. The earlier one has much of the aft section closed off. Interestingly, one is shorter than the other, though the markings placement diagram shows them the same length. There is a telescopic gun sight, a gun camera (don't want to use it; fill the hole) and a pitot tube to round things off. Instructions are the accordion style and like the rest of the kit, almost nothing is printed in English. This includes color information. 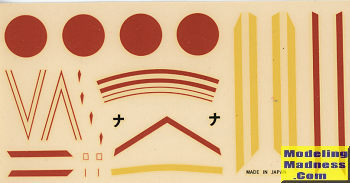 I haven't a clue as to the units offered in the decal scheme, but considering this kit's age, I'm thinking that the decals may no longer be viable, despite the kit bag still being sealed when I got it. 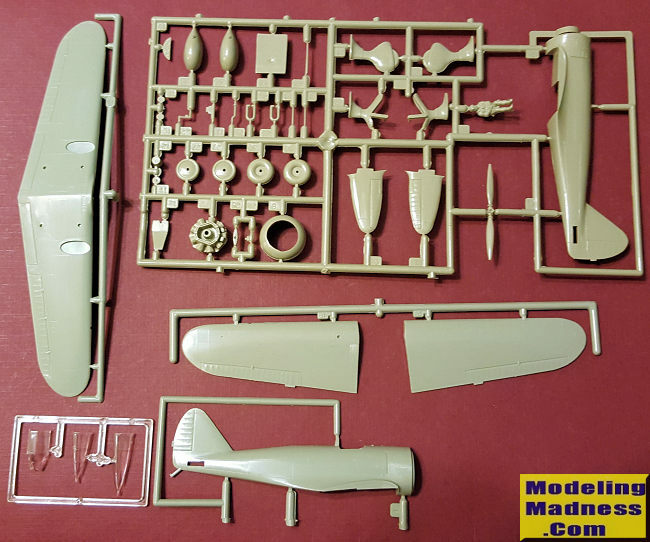 Both will be overall IJAAF grey-green with the box art plane having a yellow rudder and the other option a yellow cowling. During the intervening years, there have been other Ki-27 kits produced in this scale, most notably by RS, however, many consider that a short run kit (I do) and so the Hasegawa version is, to my knowledge, still the only mainstream injected kit of this important IJAAF aircraft. Good thing it builds into a nice model!